But the queen returned with more than the wisdom of Solomon. She also bore him a son, who brought back the “true Ark of the Covenant” to these hallowed hills — where, many in the country believe, it still rests. It may sound like the stuff of an Indiana Jones movie, but for Ethiopians, these religious precepts are serious business. The country is an island in a sea of Islamic nations, and for hundreds of years, Christianity, Islam and even native animism have all shared the same faith space. A sense of history and tradition is inescapable here. At restaurants like Yod Abyssinia in Addis Ababa, the nation’s capital, local troupes contort themselves to traditional dances like the eskista as diners enjoy foods such as kitfo, a beef dish, and injera, the pancake-like flatbread that’s a staple of the country. Tej, the local honey-wine, makes you smack your lips and lose depth perception rather quickly. But it’s about 400 miles north of the capital that Ethiopia’s sense of history really takes hold. Watching the sun sinking below the western rim of Lake Tana, coating the still, blue water with an orange sheen, I recalled the many battles waged around its now placid shores. This lake fills a thousand square miles with a drainage area five times that size. It is the source of the Blue Nile, and, some believed, it provided the realm with special powers: The Egyptians thought Ethiopians controlled the river’s flow. The river and its source were, in the words of historian Alan Moorehead, “cloaked in mystery” until only a couple of centuries ago. From here, Emperor Tewodros tried to create order from chaos in the mid-1800s, with a tyrant’s hand. The English disposed of him with an invading force, but the Brits didn’t stay. Italy tried to rule here, too, just before the advent of World War II. They didn’t last long, either. Other than Liberia, Ethiopia is the only African country never to be colonized. With wars, as with real estate, everything is location, location, location. And these mountains surrounding Lake Tana and the region, home to early Ethiopian capitals, served as a natural fortress against invaders, African or European. The mountains were ideal, too, for hatching and growing, like those surrounding the rock-hewn churches. 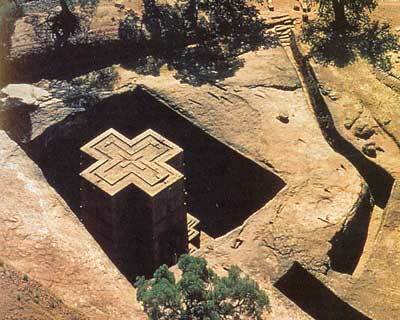 King Lalibela, the story goes, was poisoned by his half-brother about a thousand years ago. The ancient monarch slipped into a coma and visited the heavens, where he was ordered to return to Earth and build the churches, to create a New Jerusalem. The 11 churches, a Unesco heritage site, stand as a monument of human forbearance, fervor and spirit. Climbing through the rock passageways and grottos past crypts and polished stone walls towering to the sky is like taking a trek back through time. It cost a bit more than $12 to visit the churches and another $6 to capture them on video. A local guide costs about $9, and because shoes are not allowed, visitors should factor in a small tip for the “shoe bearer” who will watch their footwear while they venture inside. The most striking church is Bet Giyorgis, built to honor St. George, the nation’s patron. Looking at the church — shaped like an enormous Greek cross with its roof, walls and windows intricately carved and chiseled with ornamental flourish — and listening to priests chant in the background, I couldn’t help but wonder how the medieval Ethiopians performed such a task with the most primitive of tools. You are currently browsing the TOURIST LIFE TRAVEL & TOUR blog archives for November, 2012.